Reid Masselink (born 1974) is an American born artist, currently living in Bourron-Marlotte, France. 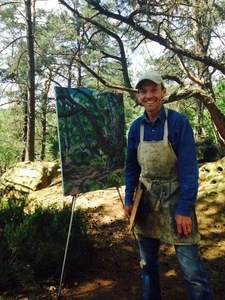 He is primarily a landscape painter, working in oils on canvas, out-of-doors, en plein air. His paintings are notable for their attention to detail and their insistence on the exuberance and diversity of nature. He paints and exhibits in Europe and the US, and gives lectures on various art related topics. Masselink earned his BA in Art from the Colorado College in 1997. He then worked as an art dealer and art historian specializing in old master drawings and paintings in New York and Paris from 1997-2004. During these years he authored an important catalog of old master Dutch drawings and worked in the Department of Drawings and Prints at the Metropolitan Museum of Art. Masselink began exhibiting his own paintings in 2004. From 2007 to 2009 he attended the New York Academy of Art, where he earned an MFA in Painting. The artist is currently represented by Galerie Nathalie Motte in Paris, France.